One of the dishes I love in eating in Malaysian hawker stalls is Pork Mee. My father and I would go all the way to Petaling Jaya to visit our favorite pork mee stall in the middle of the night. 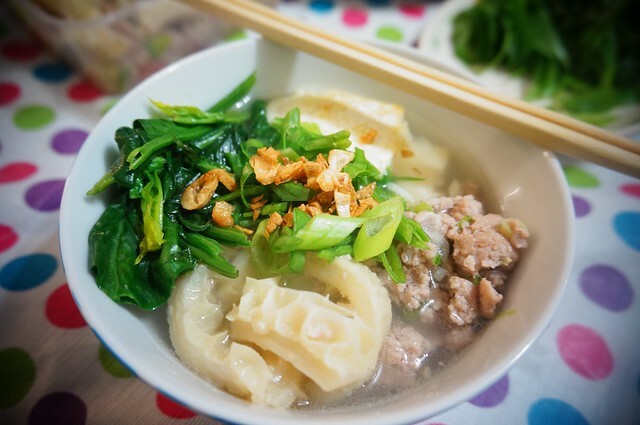 Now this pork mee stall sells a simple yet hearthy pork soup with noodles. On top are pork mince, pork ball, some boiled pork innards, veggies, and crunchy garlic. This stall lets you choose your own noodle and my dad would get the ‘rat tail’ noodle which are short round noodles that does remind me of a rat’s tail. The best part about this was the light yet flavorful broth that screams of pork and garlic. Ah crud. Now, I’m hungry. I haven’t seen a place that sells this kind of pork mee. Most of the pork mee sold here have roasted pork. Now buying pork in Wollongong can be quite pricey so I tend to buy a whole pork shoulder which I cut up to however I like it — from large chunks for adobo, or smaller pieces for stirfry. Part of this whole pork shoulder is a large bone. I’m the kind of person who doesn’t like to waste a whole bone and making pork mee is a great opportunity to draw some flavor from pork bone. Boil for as long as you can draw the flavors of the pork out and when you take the bone, the meat falls off. Depending on the size of your pork bone, this takes 2-3 hours. For the crunchy garlic, in a pan with sesame oil, cook in low heat until the garlic becomes crisp and golden brown. Be patient and try not to raise the temperature else you might burn the garlic. For the tripe, get some stock and boil it separately until it's cooked. Slice in matchsticks so it'll cooked faster. This takes 1-2 hours without a pressure cooker. Put the greens, minced meat, tofu, and trip on top. Get a spoonful of the sesame oil used for frying the garlic and put it on top. Then top it off with the crunch garlic. You can use sinigang bones to make the stock. if you feel like it, use the meat as an alternate to the minced meat. People personally season this their own way, from the kecap caramel to that ginger sesame paste, it's all up to how you want your pork mee. I honestly don’t know how authentic this is but it’s enough to remind me of flavors I miss. It sounds complex but it’s actually the simplest dish since it’s all about boiling things in the stock. I think what’s key here are the garlic and broth. I have seen pork mee stalls that uses the fried shallots rather than garlic. That is just as good too! C and I are going to Penang in July to eat. AirAsia and AirAsiaX is having a seat sale right now. Just saying. Yang mga ganyang usapan… *resists* 2017! WE DO EVERYTHING IN 2017!